I never let anyone sucker me, not even for a nickel. 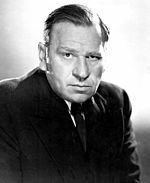 Wallace Beery attended the Chase School in Kansas City and took piano lessons as well but showed little love for academic matters. Beery and Noah Beery became Hollywood actors. Child actress Margaret O'Brien also worked with Beery and Wallace Beery ultimately had to be protected by crew members from Beery's insistence on constantly pinching her. Beery appeared in some 250 movies over a 36-year span. He was the brother of actor Noah Beery Sr. and uncle of actor Noah Beery Jr.